Four dozen Retuerta horses, an endangered ancient breed, are the first of their kind to roam Spain in two millenia. The animals, which were released over the past two years as part of a collaboration of organizations called Rewilding Europe, are leading a reverse of domestication that dates back to the Roman ages. Retuertas, which are nearly extinct and otherwise only exist in a small herd in Doñana National Park in southern Spain, are the closest living relatives to the ancient Iberian horses that lived in the region before domestication. 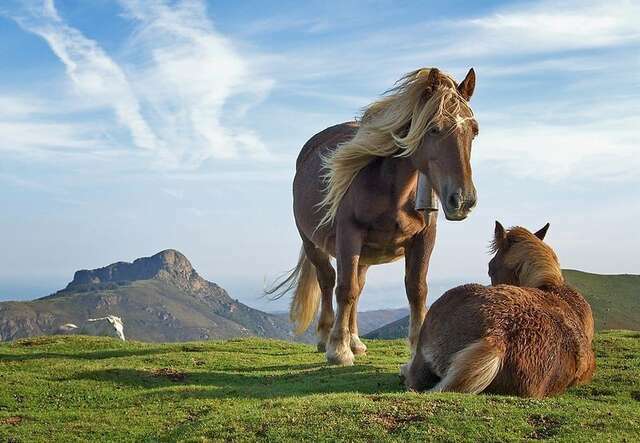 In an effort to bring the breed to a larger area, two batches of 24 horses each of Retuertas were brought to an unfenced area of western Spain called the Campanarios de Azaba Biological Reserve -- part of their historic range. "Our idea is to just let them manage the ecosystem themselves. It's a wild horse. So it's in its DNA to roam free in the wild," Diego Benito, a forestry engineer who lives and works at the Campanarios de Azaba Biological Reserve, told NPR. "Of course it is endangered -- close to extinction -- and we're conservationists," he added. "So if one of them gets ill, we could call the veterinarian. That's not the idea in the future -- we'll treat them like wild horses. But for now they could use a little care." As Spaniards abandon rural life for the city, the land they've left behind is rewilding -- returning to a landscape unseen for centuries. The first thing to come back is the underbrush, which used to be grazed by livestock but now grows unchecked -- and fuels increasingly dangerous wildfires growing in number and acreage in recent years. And just in time, the Retuertas have come in to crop some of that fast-growing foliage. "To control the bush, you need big animals -- herbivores -- to trample and graze," said Benigno Varillas, president of the subsidiary group Rewilding Spain. "People have taken their horses and cows away. So this reintroduction [of wild horses] is very important."